The first manikin to show how blood flows to the brain during CPR! • Blood Circulation Indicators: These lights will actually change speed to reflect the flow of blood in proportion to compression depth which helps students to visualize the blood flow from the heart to the brain during CPR. • Compression Indicators: The indicators will light partially or completely, depending on the CPR quality. 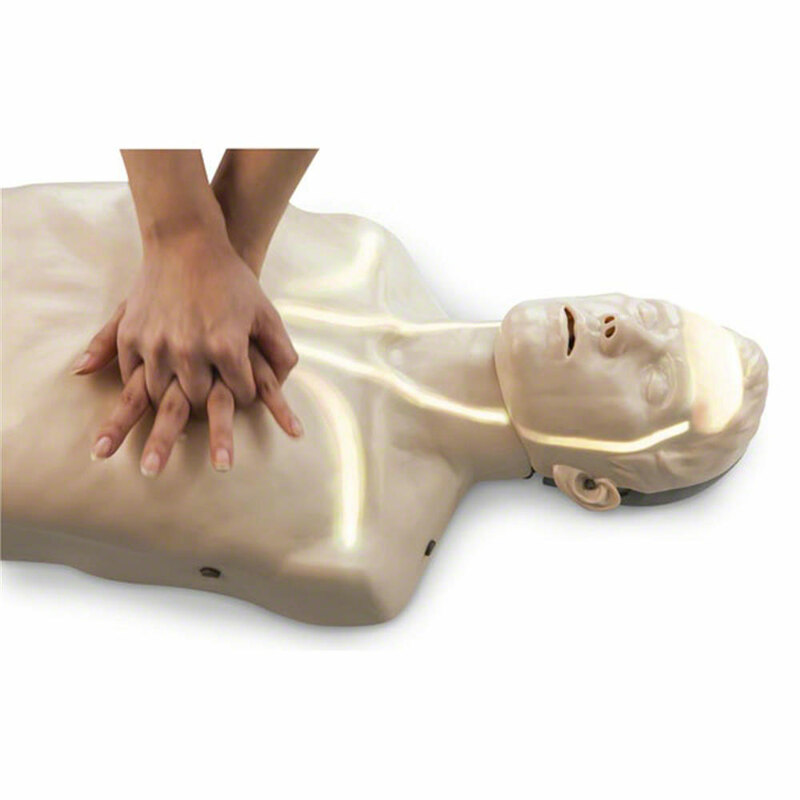 Completely lit indicators show when the CPR process is being performed correctly. Indicators are interrelated with the given default value of depth and compression speed prescribed in the 2015 CPR Guidelines. • CPR Quality Indicators: These indicators will light only when the compression depth and speed correctly match with the given default value. • Anatomical landmarks, including the sternum, rib cage, sternal notch, and xiphisternum. • Audible feedback (clicker) helps to reinforce the correct compression depth. 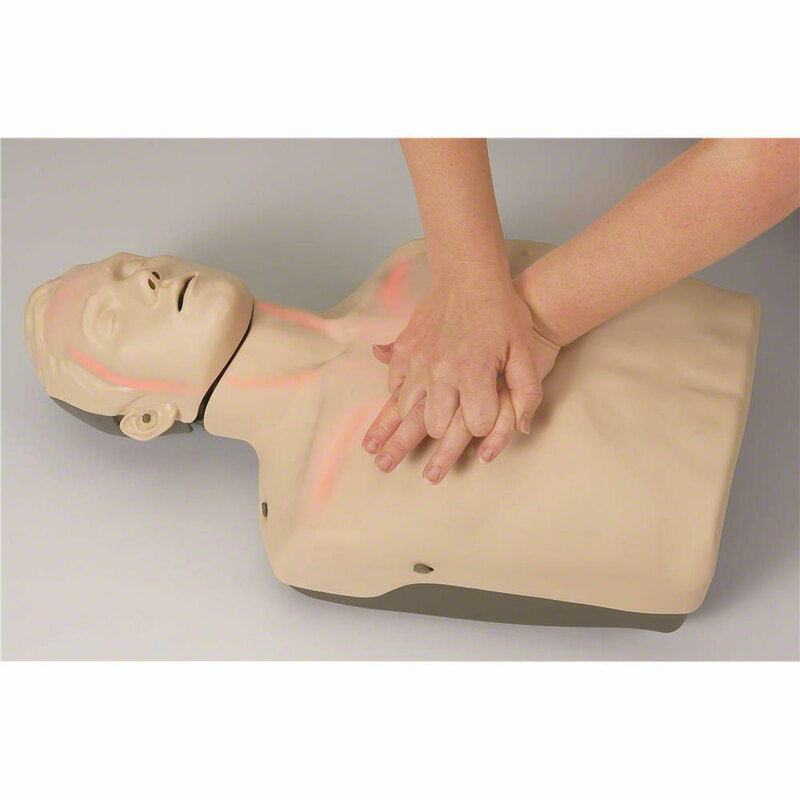 • Highly realistic chest rise when the student performs correct ventilations. • Oral and nasal passages allow for a realistic nose pinch, required for proper mouth-to-nose ventilations. • Realistic head tilt and chin lift for opening the airway. • Available with white or red blood flow indicator lights (select light color preference in the dropdown window above). 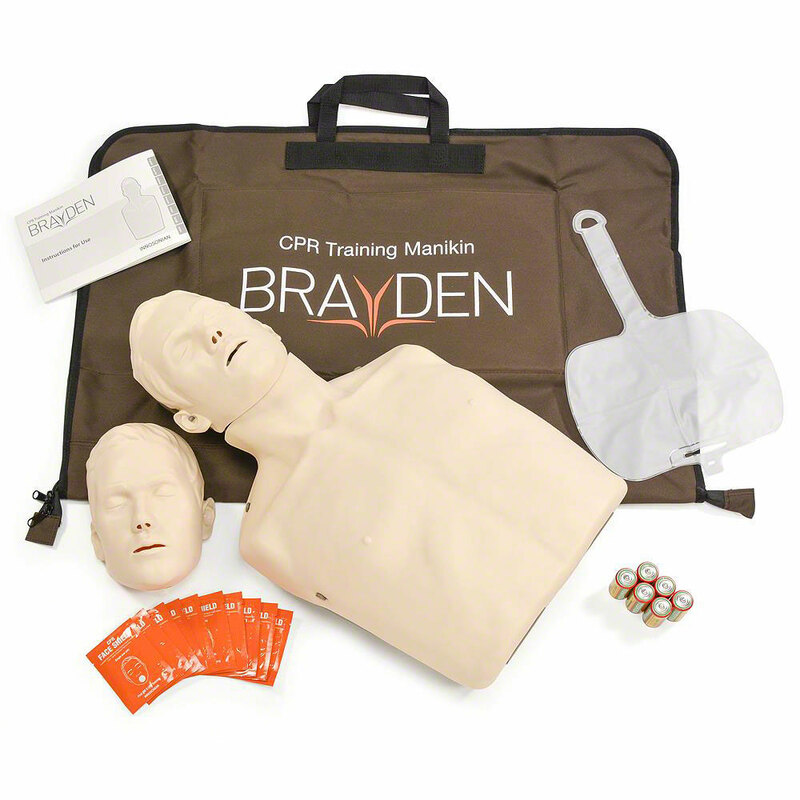 Manikin ships with 1 spare face, 1 lung bag, 10 face shields, 6 "C" cell batteries, instructions for use, carry bag/kneeling pad. Skin is RoHS and REACH compliant, and is not made with natural rubber latex. Cleanup is quick and easy. It is recommended the lung bag should be replaced after each class (see Related Items below). Measures 24-5/8"L x 14-3/8" W x 9-13/16" D. Weight - 9.5 lbs.